OXFORD, Miss. – As the Scout Law states, a Boy Scout is helpful, so the Boy Scouts of America is helping the University of Mississippi fund two new graduate positions in its recreation administration degree program. The BSA has awarded the university $20,000 to fund two graduate assistantships. Julie Chambers, the district executive for the Tallahatchie District of the BSA Yocona Area Council, won the award in a “shark tank” funding competition hosted by the BSA Southern Region. Chambers, also a member of the advisory board for the Ole Miss recreation administration program, is working with Kim Beason, UM professor of recreation administration, to establish the program. 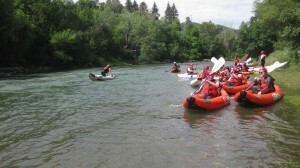 Boy Scouts and adult leaders from Oxford’s Troop 146 head out on a kayaking trip on the Lower Animas River in Durango, Colorado, part of a two-week adventure in southern Colorado and northeastern New Mexico for 15 Star, Life and Eagle Scouts from the troop. The Department of Health, Exercise Science and Recreation Management is recruiting students for the project, which begins in fall 2016. The two recipients will be awarded $10,000 each annually. The Southern Region asked for an innovative way to increase BSA professionals, said Chambers, who attended graduate school on a number of different fellowships. After sharing her background with another Scouting professional, the two came up with a program that will benefit both the Yocona Area Council, which includes most of north Mississippi, and UM graduate students. “Our goals are to increase the BSA presence in north Mississippi and to serve more communities,” Chambers said. “In the future, we want to introduce a new Scout program called STEM Scouts. We want the graduate students to write grant proposals to create a self-sustainable program. Rick Chapman, the Scout executive of the Yocona Area Council, said he anticipates great results from the collaboration between Boy Scouts and the university. The Yocona Area Council of the Boy Scouts of America serves 12 counties in northeast Mississippi: Alcorn, Benton, Itawamba, Lafayette, Lee, Marshall, Prentiss, Pontotoc, Tippah, Tishomingo, Union and Yalobusha. The council headquarters is in Tupelo. The council’s Tallahatchie District serves Pontotoc, Tippah and Union counties. Boy Scouts with Troop 146 in Oxford go backpacking in the Sipsey Wilderness of northern Alabama. Supported by 1,100 volunteers and 130 chartered partners, the council serves more than 4,000 youth annually in five programs: Boy Scouts, Cub Scouts, Venturing, Learning for Life and Exploring. For more information about the Yocona Area Council, visit http://www.yocona.org. For more about the UM Department of Health Exercise Science and Recreation Management, go to https://hesrm.olemiss.edu/.